As was common in many countries, the British soldier was mostly looked down upon by society, or at least by 'polite' society, and Wellington himself famously described them as the scum of the Earth. Certainly the life of an infantryman held few attractions for anyone in steady employment or living in reasonable comfort off the land, but fortunately for the country there were others too. Men with a criminal past to escape, an unwanted wife and children, large debts or any of many other reasons to want to change their lives completely and take the King's shilling. Wellington further remarked that it was wonderful what fine soldiers were made from such unpromising material, and as a body British infantry were much admired for their discipline, courage and steadfastness. While their skills with the musket were certainly well known, the advance with bayonets must have terrified many a soldier facing them, and here we have a whole set devoted to little else. 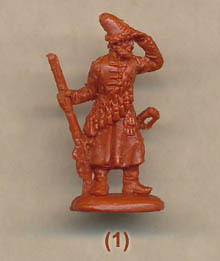 All the multiple poses in this set depict one basic posture – advancing with musket held up in front. As a pose there is nothing wrong with this, although we would have expected to see something a bit closer to the box illustration, which shows troops advancing with bayonet much lower. Every man has his left leg forward, so seems still to be in formation. The variety of posture is quite significant here, with some men holding their musket upright. This is not a sensible posture when attacking with bayonet, so presumably such men are in the process of lowering their muskets, but it does devalue the impression given as it means there is not the largely continuous line of bayonets that might intimidate an enemy. For once therefore we wondered whether a bit less variety would have been better here, at least avoiding the fully upright weapons. The poses of the single figures are rather better in our view. First we have two pioneers advancing with axes in hand. Naturally this did not happen unless some obstruction was expected – such men were armed with a musket like everyone else and would have used it in the same way in an attack (the axe was not a weapon). So while arguably of little value 'in attack', the poses are useful in other situations. 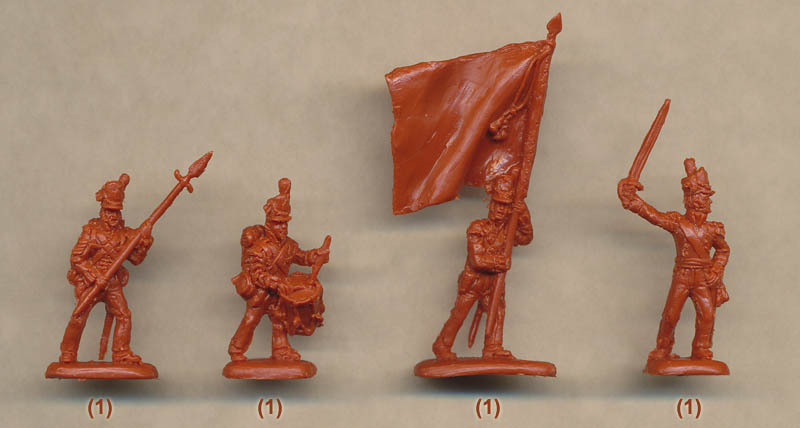 Then we have a sergeant advancing with spontoon, followed by a drummer, ensign with flag and an officer. All are moving forward and perfectly reasonable poses. Every man here wears an uncovered 1812-pattern shako, with the false front, badge and small plume. This of course is the style worn at Waterloo and dates the men to the last few years of the Napoleonic Wars – a popular setting. In all other regards too the clothing is correct for this period, including the single-breasted coats with the short tails, the campaign trousers and the shoes. Contrary to the box artwork all the men seem to have wings on their shoulder straps, making them from the flank companies rather than the centre ones, and other clues tell us that these men are from a grenadier company. Both the pioneers wear an apron, and the officer wears the usual double-breasted coat, in this case with the lapels closed all the way up. The drummer has chevrons or darts along both sleeves, which is correct, and the sergeant with the spontoon has four chevrons on his right sleeve. These identify him as either a sergeant-major or a quartermaster-sergeant, although as he wears the ordinary private's coat, and sergeant-majors wore an officer-style double-breasted coat, that seems to rule out the former rank. He wears no sash, which was a surprise though we could not be sure if this is incorrect. The equipment on each man is mostly accurate. Each has a haversack and water bottle on the left hip, over the bayonet scabbard, and a cartridge pouch on the right hip. The sergeant and drummer correctly have all their items on the right hip so as not to interfere with the sword they have on the left, but strangely one of the pioneers also has this arrangement, even though he has no sword or other reason to do so, so is likely to be wrong. All bar the officer and ensign have the full rectangular pack, and as with an earlier set this has been incorrectly done with external pockets on each side, which is a fantasy of the sculptor. Completing the picture is a greatcoat rolled on top and the mess tin strapped to the outside. In addition the two pioneers have bill hooks in pouches attached to the waist belt, which is great, but despite both holding an axe there is no sign of the case for this, nor for a saw or any other tool of their trade. Some sources suggest such men had a smaller pack to make room for such tools, but this seems uncertain so the usual pack on both these men may well be acceptable. The command figures require a few more observations. The ensign holds a flag on a staff of a little over three metres in length with the spearhead finial, which is perfect, but the flag itself is a little on the small side compared to the real thing, though this is hard to notice. The spontoon held by the sergeant is about 30mm (2.16 metres) in length, which is quite a lot shorter than it should be (about three metres). The drummer has a good-sized drum, and is a little shorter than the others, so presumably a youth. He appears to actually be beating the drum, though this is quite awkwardly realised here. The sculpting is reasonably good, and certainly a big improvement on the traditional chunky Strelets style of old. Some smaller elements are still a bit exaggerated, or else hard to make out clearly, but these figures will probably mix fairly well with the output of other manufacturers. Some details like the beards on the pioneers are nicely done, and there is no flash anywhere. The main pose is a little curious and perhaps not the one many would have chosen, plus it is a shade flat in some cases. The sculpting is good and although there are a couple of accuracy flaws these are pretty minor and don’t seriously detract from the whole. The command figures caught our eye more than the main pose, so there is plenty here to appeal to anyone with an interest in the last year or so of the Napoleonic Wars.